OXFORD, Miss. – The University of Mississippi is included in the elite group of R-1: Doctoral Universities – Highest Research Activity by the Carnegie Classification of Institutions of Higher Education, the definitive list for the top doctoral research universities in the United States. UM is among a distinguished group of 115 institutions including Harvard, MIT and Johns Hopkins in the “highest research,” or R-1 category. This group represents the top 2.5 percent of institutions of higher education. The Carnegie Classification analyzes Integrated Postsecondary Education Data System, or IPEDS, data from all U.S. post-secondary institutions and evaluates measures of research activity for doctoral universities in making its assessments, which are released every five years. The Carnegie Classification’s assignment to categories of highest, higher and moderate research activity is based on research and development expenditures, science and engineering research staff including post-doctoral candidates and non-faculty staff members with doctorates, and doctoral conferrals in humanities and social sciences fields, in STEM fields and in other areas such as business, education, public policy and social work. 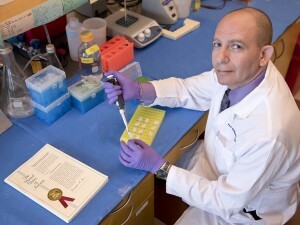 Dr. Wael ElShamy, director of the UMMC Cancer Institute’s Molecular Cancer Therapeutics Program, has received a patent on a method to diagnose and treat several cancer types and subtypes. The method may lead to the first targeted therapy for triple negative breast cancer and add to therapies for other cancers. Alice Clark, UM vice chancellor for research and sponsored programs, applauded the university’s new classification and affirmed the vital economic role that a world-class research institution plays in the state and region. Dr. LouAnn Woodward, vice chancellor for health affairs and dean of the School of Medicine at the UM Medical Center, was elated at the Carnegie distinction. The university received more than $117 million in sponsored awards, with more than $105 million in research and development expenditures, during fiscal year 2015. Of that total, more than $77 million was in federal grants, more than $16 million was from foundations, about $11 million came from the state of Mississippi, approximately $8 million was from industry and roughly $4 million came from other sources. UM researchers submitted 876 proposals and 546 research projects were funded in the last fiscal year. Among the university’s most prestigious and longstanding research projects is the Jackson Heart Study. UMMC researchers are collaborating with Tougaloo College and Jackson State University on the world’s largest long-term study of cardiovascular risk factors in African-Americans. In 2013, the university joined the American Heart Association and Boston University for “Heart Studies v2.0,” which will expand upon the landmark Framingham and Jackson studies to improve the prevention, diagnosis and treatment of cardiovascular ailments. The population study has followed the health of 5,000 participants, producing data that continues to yield insights into the underlying causes of cardiovascular disease. In 2013, the National Heart, Lung and Blood Institute, and the National Institute of Minority Health and Health Disparities, each a part of the National Institutes of Health, announced renewed funding for the JHS. 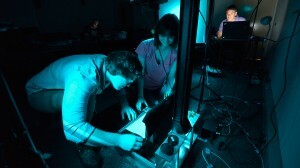 Other long-term prestigious projects are the marijuana research project conducted by the university’s National Center for Natural Products Research, jet noise reduction studies at the National Center for Physical Acoustics, known as NCPA, and the Laser Interferometer Gravitational-wave Observatory collaboration through the Department of Physics and Astronomy. Faculty and postdoctoral researchers in the physics department played major roles in the search and discovery of the Higgs boson, the subatomic particle thought to be responsible for all mass in the universe. The discovery was announced July 2012 by scientists at CERN, a multinational research center headquartered in Geneva. Most recently, two faculty members within the physics department and NCPA received a $3 million Department of Energy grant to study nuclear fuel storage safety and stability. Three Ole Miss professors received Faculty Early Career Development Awards from the National Science Foundation within the past eight months. Patrick Curtis, assistant professor of biology, is the seventh CAREER award recipient at the university in the last eight years. Sarah Liljegren, associate professor of biology, received the award last November and Jared Delcamp, assistant professor of chemistry and biochemistry, earned a similar award in June 2015. This marks the first time three UM faculty members were selected in the same academic year. From its first class of 80 students in 1848, UM has grown to a doctoral degree-granting university with 15 academic divisions and more than 23,800 students. Located on its main campus in Oxford are the College of Liberal Arts; the schools of Accountancy, Applied Sciences, Business Administration, Education, Engineering, Journalism and New Media, Pharmacy and Law; and the Graduate School. The Medical Center in Jackson trains professionals in its schools of Medicine, Nursing, Health Related Professions, Dentistry, Pharmacy and Graduate Studies. In all, more than 100 programs of study offer superior academic experiences that provide each graduate with the background necessary for a lifetime of scholastic, social and professional growth. Strengthening and expanding the academic experience are the acclaimed Sally McDonnell Barksdale Honors College, Croft Institute for International Studies and Lott Leadership Institute. For more information about research at UM, visit http://research.olemiss.edu/.